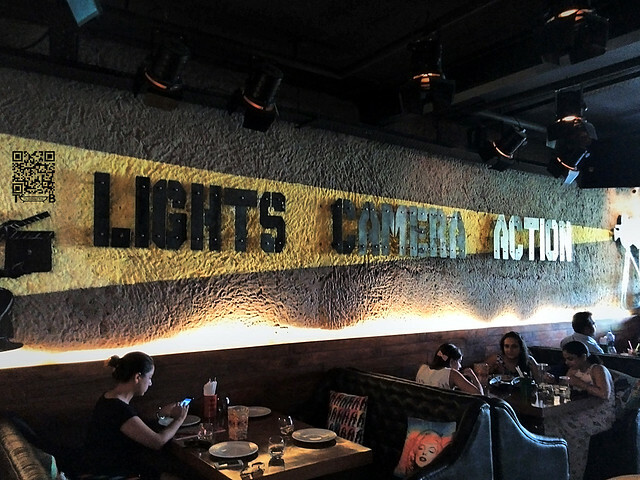 Finally Delhi has an all new power hangout spot, dubbed Lights Camera Action – Air Bar. The place offers strong spices with an interesting twist of molecular gastronomy in a cinematic way. 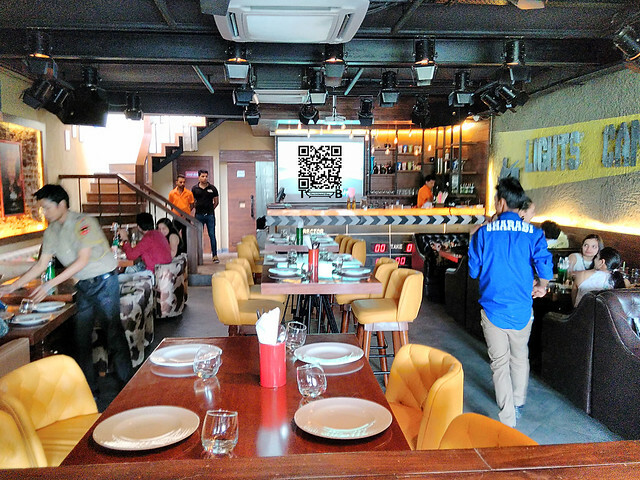 Located on the Rajouri Garden main road, it can be easily spotted and thanks to its valet parking you don’t have to worry about finding a parking spot. 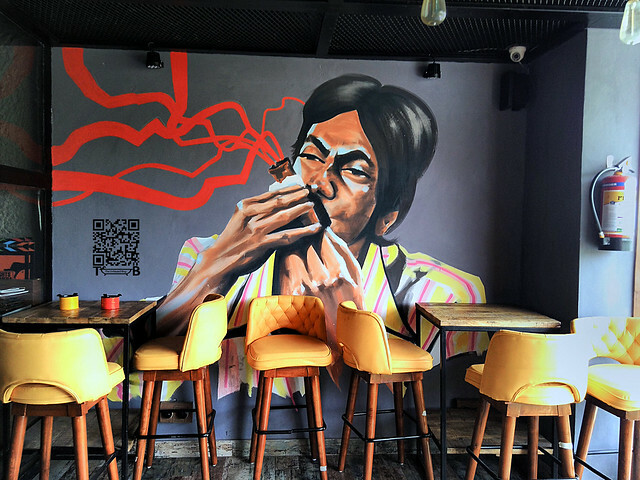 The joint has both indoor and outdoor seating with a huge roof top seating and a cosy indoor area. As soon as you give your car keys to the valet and move towards the elevators/stairs you realise that it’s a really filmy place with Dabbang style police officer escorting you to the main entrance. Oh before you decide wether to take the stairs or the elevator, you’d meet 6 feet tall Ironman statue looking at you in the eyes. If you take the stairs you’d be see all famous movie posters on the walls till you reach the lounge entrance. 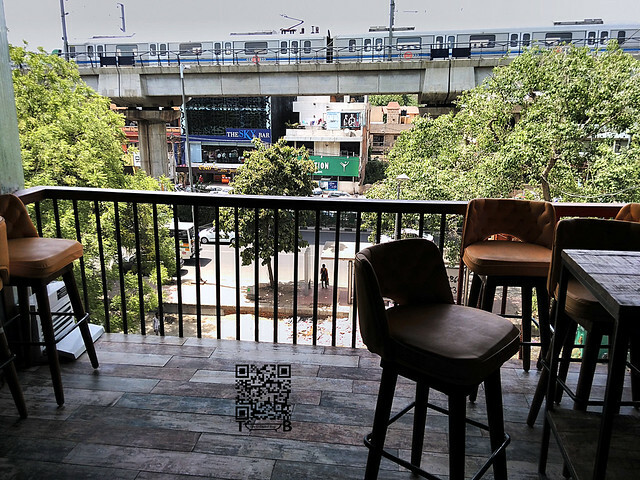 Upon entering you’d have an option of taking a left to sit indoors, taking a right to sit outside on the porch overlooking the main road and metro track and the stairs to head to the roof (Air Bar). Blending these tried and tested Indian recipes with molecular gastronomy, opens a wide dimension which can’t be entirely expressed using words, but I will definitely try my best. 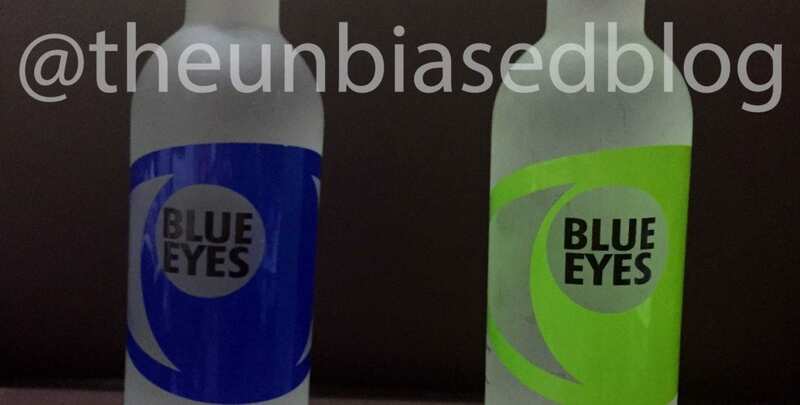 😉 Molecular gastronomy combines principles of physics and chemistry to give a different taste and texture to food which results in a unique and sometimes improved dining experience. This segment of food and beverage definitely require creativity. All the dishes that we tasted were unique and had their own personalities, below starts our virtual polaroids from our afternoon spent at Lights Camera Action – Air Bar. Our culinary adventure started with Rajnikant’s Early Morning Tea 😉 commonly known as Rasam. The chef prepared the drink on our table itself, the aroma of the freshly ground spices and curry leaves enchanted my taste buds. The coconut powder transformed into oil as soon as I stirred the drink. I must say it opened all my senses as it had the perfect blend of spices. My husband is not much of a spice lover so to sooth his throat we had Kesar Lassi Shots next on our table. To create a feel of cold to the lassi, it was presented in such a way (You can have a look below). It was impressive I must say. The icing of the afternoon was the Hollywood Papdi Dhokla Chaat. The chaat trolley came in full on Bollywood style with smoke all around like a magician with all the edible delights. Yet again it was presented in a way I did not expect, using Liquid Nitrogen all the heads were turned to our table. To my surprise we witnessed dhokla dipped in liquid nitrogen and the sauces like tamarind, mint and yoghurt. After relishing on the chaat papdi next on our table was Vegetarian Murg Tikka, yeah like all you guys I also checked the name twice from the chef. Then he told us it’s the Soya chaap which melted in our mouth. Along came the Pyaar Tune Quesadilla, it was tortilla bread stuffed with cheese and sauted vegetables in Kolhapuri spices. Yes, it was as spicy as the kolhapuri mirchi. 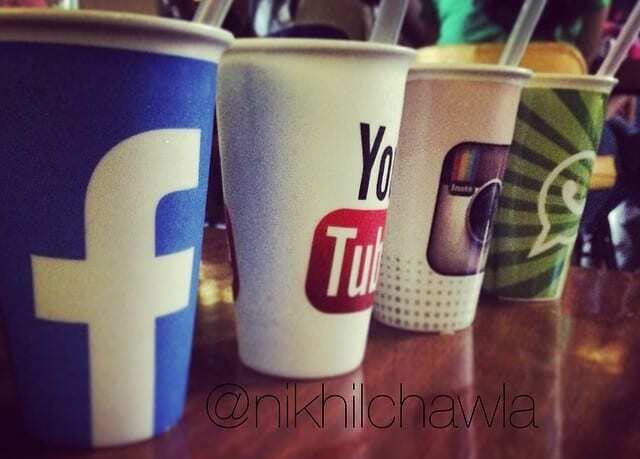 After all these appetizers there was no place left for main course so the last thing we were served were the Social Media Shakes. We had Chocolate and Strawberry Milk Shakes, which were rich and thick in taste.